Make your starter home stylish. 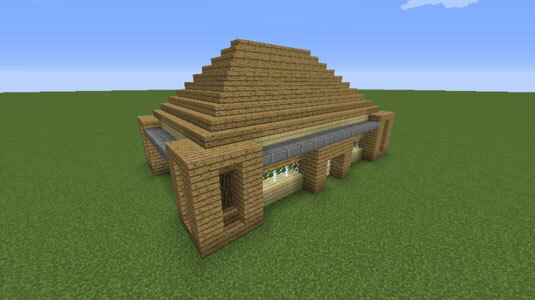 Building a stylish starter house in Minecraft makes the game more fun and lets you show off to your friends. Start with a square or rectangle. When building a rectangle, go to one of the longer sides of the house, and in the middle of the wall, knock out 1 block of the wall if there are an odd number of blocks on the row, or knock out 2 blocks if there are an even number of blocks. On a square house, choose any side and do the same thing. Wherever you make the hole is where the door will be placed, so place the door (or double door) in the hole you just created. The door is 2 blocks tall. On the 1 block adjacent to both sides of the door, add 2 blocks upward, to make the wall 1 block taller than the door, creating pillars. Connect the two pillars you made at the top with a block. Then go to each corner of the house, and build upward 3 more blocks. (The final block you place is on the roof level.) Then build 2 blocks upward on the blocks adjacent to each corner. The blocks don’t respond to gravity, so you can simply place blocks all around at the third block height. The house should now have a base level and a top level. Now add a flat roof to the top, fill in the holes on each wall with glass planes, and, finally, replace the floor with any material you want (such as wood or carpet). 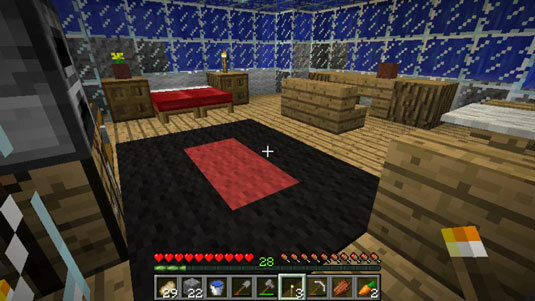 Place your chests, bed, crafting tables, bookshelves, and other items in your new, stylish house. Improve the exterior design in three stylish ways. After your starter home is set up, it’s time to decorate! Shape: After building a simple square or rectangle, make additional square wings that branch off the main building, creating U-shaped houses, L-shaped houses, second stories that are shifted a few blocks off center. Depth: Create a wall where the blocks alternate in depth, like the black square on the first two rows of a checkerboard (almost like a zig-zag). 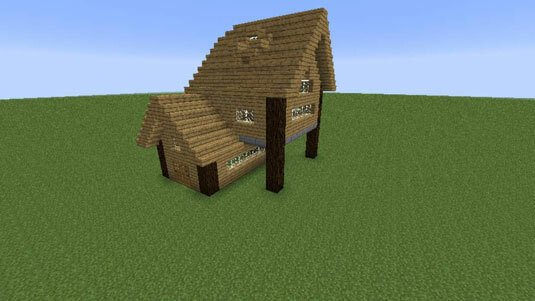 Detail: Add the small details, such as a chimney, a stained glass window, or even some stairs! Make the building look like it has been there for a long time, using moss stone or planting tall grass. Many players like to hide the lighting that they use in the structures they build. Earlier in the game, when you have fewer ingredients available to you, try pot lights, which are recessed ceiling torches with glass under them. But that isn’t the only option. Carpet in particular is an easy and attractive solution. Ice and water are also blocks that let light through, but they subtract two from the light level, providing a dimly lit area. 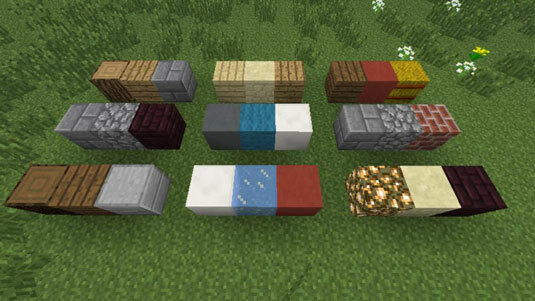 Combine blocks in different ways. Understand circles, spheres, and domes. Start out with a base row that’s at least 2 blocks long (also called the first segment at the top of the circle). Then subtract 1 from the number of blocks you have in the base row and place that number of blocks in a row below the first segment, creating a stair step. This is the second segment. Repeat this step until you have only 2 blocks in a segment. When you have only 2 blocks in a segment, look at how space you have to make your circle, and then place 1 block diagonally until you reach the edge of your available area. Reverse what you did earlier so that you add 1 block instead of subtract 1, creating sideways stair steps. This step forms the sides of the circles. Repeat this step until you reach the original number of blocks of your base. Repeat this process to create the bottom of the circle. What is a living room without a couch? You can customize furniture in a million different ways, so you should experiment to see what works. Several websites and YouTube channels also offer tutorials. Learn how to build furniture from Citycraft. Play with sand and gravel. Do you ever need to build scaffolding (often called towering up, in Minecraft)? No problem: Use sand or gravel! The special quality of these two blocks is that they are some of the few blocks that are affected by gravity. 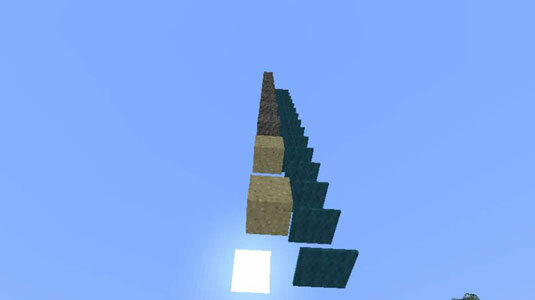 When sand or gravel fall on blocks that are not full size (such as torches), the sand and gravel simply drop without affecting the block they hit. A roof shields you from the elements of water and snow, and from those pesky spiders, which can climb walls. Stairs are often used as roofs. 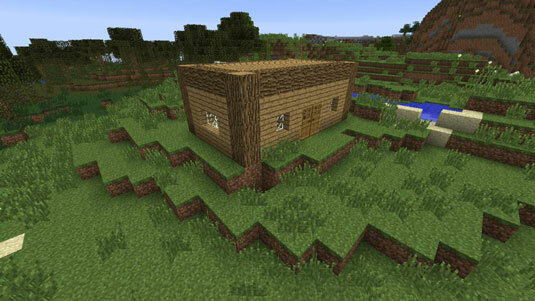 Ever looked at a villager’s house? It has stairs for a roof. Just go around the top of the building to place the stair blocks. When you finish the first layer, go 1 block up and in, and go around in circles again. Each layer stair-steps. After you have made a simple roof, you can always stop after a few stair-step layers and simply place a flat roof as the final layer. Terraforming in real life involves earth-shaping. 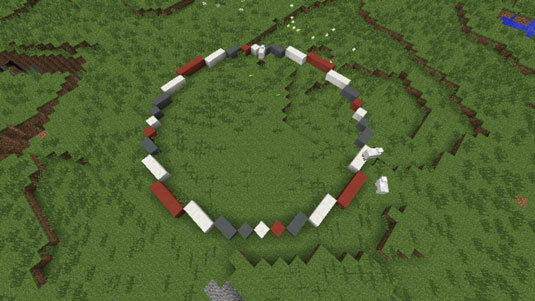 When you terraform in Minecraft, you make an item look like it was already there in the naturally generated world. 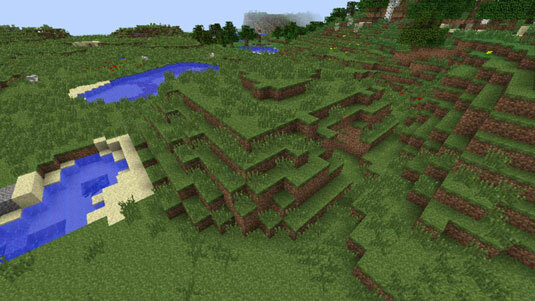 Terraforming is used largely to hide bases, traps, or obstacle courses (often called parkour courses). The pressure plate is the way to go. 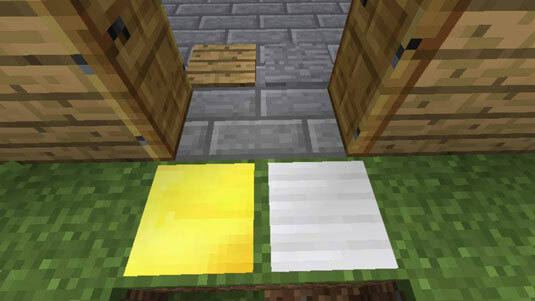 Minecraft now has four different types of pressure plates: stone, wood, iron, and gold. Pressure plates work well to help you open and close the door so that you don’t have to waste time right-clicking.